Turkey wings are dark meat, which makes them higher in fat and calories than white-meat turkey. However, turkey wings are a source of protein and other nutrients, such as selenium, iron and calcium. A roasted turkey wing makes for a protein-packed main course. 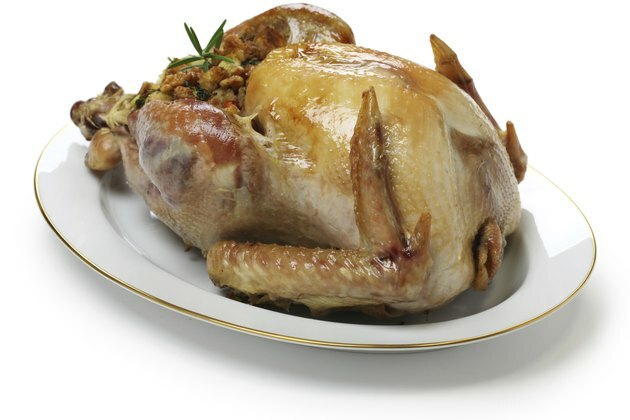 If you are watching your intake of cholesterol, it's best to remove the skin from the turkey wing before eating. Turkey wings vary in size, but on average, a wing with the bone in weighs about 3 ounces. Eating one roasted turkey wing, including the meat and skin, adds 221 calories and 11 grams of fat to your daily intake. According to the Penn Medicine website, adult women should consume about 2,200 calories per day, while men should aim for getting 2,900 calories per day. Women should keep their fat intake below 73 grams per day and men should try to stay under 97 grams of fat per day. These numbers are recommended for healthy people under 50 who get a moderate amount of exercise. Getting plenty of protein in your diet helps your body grow new cells and repair cells that have been damaged. Adequate protein is an especially important dietary requirement for growing children and pregnant women. According to the MedlinePlus website, healthy adults should aim for getting two to three servings of lean protein, such as the protein found in a roasted turkey wing, per day. Eating a roasted turkey wing, with the skin, adds 27 grams of protein to your diet. One roasted turkey wing, with the skin on, contains 30 micrograms of selenium. Selenium is an essential nutrient for overall health. Eating a diet rich in selenium can help ward off free radicals that cause cancer and heart disease. The Office of Dietary Supplements recommends that healthy adults get 55 micrograms of selenium in their daily diets. Eating a roasted turkey wing also adds small amounts of iron, calcium and magnesium to your diet. Treat yourself to a roasted turkey wing with the skin on and you add 81 milligrams of cholesterol to your daily intake. The American Heart Association recommends keeping your daily cholesterol intake to less than 300 milligrams per day. If you are concerned about your cholesterol, consider turkey wings with the skin as an occasional indulgence, keep your portions under control or remove the skin from the wing before eating to reduce your cholesterol intake. Penn Medicine: How Much Fat Do You Need?